MotoGP championship leader Valentino Rossi will start the season finale in Valencia from the back of the grid after the Italian was penalised for clashing with Marc Marquez at the Malaysian Grand Prix on Sunday. Dani Pedrosa claimed a dominant victory at Sepang and was followed home by Rossi’s Yamaha team mate Jorge Lorenzo, who has closed the gap on his championship rival to seven points ahead of the decider in Spain in two weeks’ time. After an inquiry, Race Direction opted against docking the seven-time premier class champion any points but imposed a “three point penalty” that will see him start at the back of the field in Valencia. The duo darted into corners trying to get the upper hand, swapping places and touching wheels a number of times until Rossi slowed at Turn 14, forced Marquez wide and then flicked out a knee, which resulted in his rival’s Honda sliding into the gravel. “You know unfortunately I lose a lot of time with Marc and in Turn 14 I tried to go wide to get a better line to make him slow because he just rides to cause me some problems,” MotoGP’s official site quoted Rossi as saying. “Unfortunately he came to me and I think he crashed in that moment. It’s a shame because I think that in a normal race we can stay and fight with Jorge and we lost some more points. “In Valencia, will be more difficult,” he added, looking ahead to the season-ending race on Nov. 8. By avoiding disqualification, Rossi remains on 312 points ahead of the Valencia Grand Prix, seven ahead of Lorenzo with 25 available for victory in Spain. 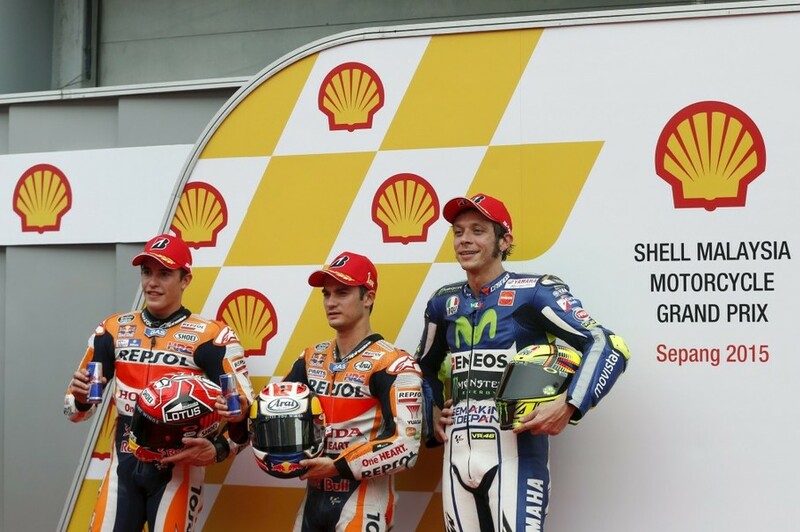 There was more drama on the podium as a largely pro-Rossi Malaysian crowd booed Lorenzo when he picked up his second-place prize, with the Spaniard storming off immediately after the anthems and not waiting to pose for photographs. Rossi then declined to attend the traditional post-race news conference, where double world champion Lorenzo said: “I don’t think it’s a good decision. He took out Marc, and Marc gets zero points but he gets 16 points. “I think it’s unfair and maybe because of his name he can get no (worse) decision this time. Lorenzo also believes Rossi’s behavior could damage his global brand despite the Italian receiving a far warmer welcome than his title rival on the podium. Pedrosa, whose brilliant ride from pole to flag was almost forgotten amid the drama, lamented Rossi’s decision to avoid facing the media. “Valentino should be here to explain it, I said many times we should race more calm,” he said.